Kimchi is a traditional Korean food manufactured by fermenting various vegetables with a variety of seasonings. It is also spelled as Kimchee or Gimchi. Kimchi can be made with white radishes, mustard greens, scallions, or cucumbers. The reddish fermented cabbage or radish made with a mix of garlic, salt, vinegar, chile peppers, and other spices is served at every meal. Here on this page we will see some of the useful health benefits of kimchi a traditional Korean food. Kimchi is a low-calorie, high fiber, and nutrient contained dish. It contains vitamin A, vitamin B1, vitamin B2 and vitamin C.
One serving also provides over 50% of the daily recommended amount of vitamin C and carotene. Also rich in iron, calcium, amino acids, selenium. Contains lactic acid bacteria, among those the typical species Lactobacillus bacteria. Contains a low amount of fat and sugar. It is rich in antioxidants with phenols and flavonoids which shields the body from harmful effects of oxygen free radicals. It is a source of lactobacillus bacteria which helps in weight loss by controlling the appetite and reducing blood sugar levels. Also, it contains fibre which makes body full and hunger satisfied. It promotes better digestion due to the presence of the lactobacillus bacteria. It contains cabbage which has detoxification property. Fibre content also assists in stabilizing bowel movements and prevents constipation. 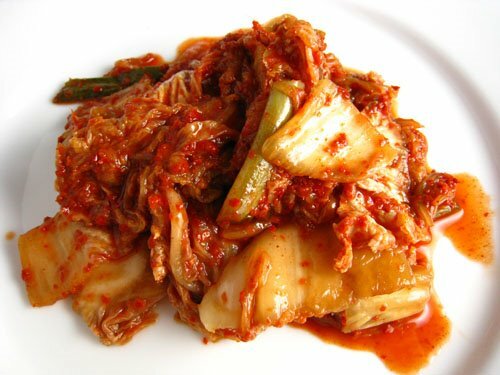 Fermented kimchi helps in lowering the total cholesterol and LDL cholesterol along with the concentrations blood glucose in the body. It is made up of a variety of ingredients like ginger, garlic, and peppers which brings beneficial effect on an immune system. They are helpful in cold and flu symptoms. Due to the presence of vitamin C and antioxidants, it has anti-ageing qualities. Kimchi helps in reducing the risk of development of various cancers.It contains Cabbage which contains healthful flavonoids that help in inhibiting the growth of cancer cells.